Who doesn't enjoy sidewalk chalk? 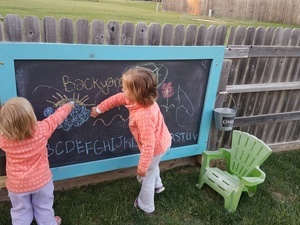 We love it at our house, so much we wanted to make a special place to draw in the backyard by making a chalkboard to hang off of our fence. With a quick trip to Home Depot we had the supplies we needed and were ready to start! If this is something you would like for your own yard, you can find out what we used below. While your paint is drying, use a miter saw to cut the 1x4 boards into a frame. Assemble your frame using nails or screws. Use any exterior paint or stain to add a pop of color to your frame. When dry, you have the option to use an exterior sealer to ensure your frame holds up against sun and rain. When everything is dry you are ready to assemble! Lay the frame on a flat surface with the backside facing up. Use generous line of Liquid Nails all the way around the frame. 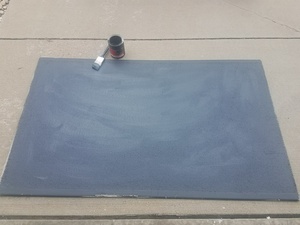 Place the chalkboard down onto the frame and lightly press. Using a couple extra screws to help hold everything together is optional, but certainly worth while. 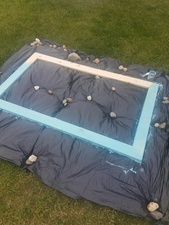 Leave everything to lay for about an hour to make sure the glue is dry before hanging it up. Once everything is dry, you are ready to display! This project take a little extra time, but definitely worth it when you see the hours of fun it will bring to your yard!